When it was founded in 1978 by Bernie Marcus and Arthur Blank, The Home Depot began changing consumers’ perspectives about how they could care for and improve their homes. The Company created the “do-it-yourself” concept, spawning an entire industry that now spans the globe. Today, The Home Depot® is the world’s largest home improvement specialty retailer, with more than 2,200 retail stores in the United States (including Puerto Rico and the U.S. Virgin Islands), Canada, and Mexico. 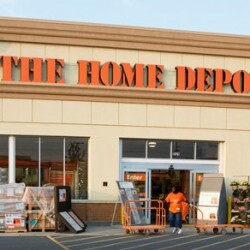 The Home Depot’s stock is traded on the New York Stock Exchange (NYSE: HD) and is included in the Dow Jones industrial average and Standard & Poor’s 500 index.